Accommodation in well furnished Deluxe A/C Room. One day North Goa Sight-seeing with Boat Cruise on river Mandovi (Subject to weather conditions). Airport / Margao Railway Transfer on prior intimations(between 9 am to 6 pm only). One day North Goa sight-seeing with Boat Cruise on river Mandovi (Subject to weather conditions). Airport / Margao Railway Transfer on prior intimations (between 9 am to 6 pm only). Complementary use of Jacuzzi and Swimming Pool. This package is not available from 23rd Dec 2013 till 3rd Jan 2014. The Longuinhos Beach Resort is located on Colva Beach, about 10 minutes drive from the Margao Railway Station, 20 minutes drive from the International Airport at Dabolim and close to Goa's commercial hub. The capital Panjim, a charming little city along the river Mandovi is a 45-minute drive away. 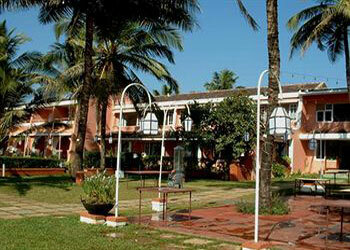 Resort offers 50 well-appointed rooms all facing the sea, just 90 metres away. Room facilities include satellite television, attached bath, 24 hour room service and more. Most rooms have their own private balcony. Resort facilities include 3 restaurants, bar, conference facility, doctor on call, travel desk, telephone with STD/ISD, tour planner, swimming pool, jacuzzi, children's pool, ayurvedic massages, safe deposit locker. Accepts all major credit cards.